Vrat ka paratha or sama rice paratha is easy and low calories fasting or upvas recipe. This is prepared on fasting days including Navratri, Ekadshi, Janamashtmi. Sama rice paratha is very nutritious, healthy, filling and gluten-free. Biologically known as Echinochloa colona, sama rice is also known with different names in different places, in Gujarati, it is called Samo or Moriyo, in Marathi, it is called Bhagar or varicha tandul, in Hindi, it is called as Mordhan or sawa ka chawal or Samay ke chawal or Samak, samo, swang ke chawal. It keeps you full during fasting days and gives you energy. Sama rice paratha can be prepared with storebought sama rice flour or you can make it at home. Just grind it till fine powder. Sieve it to remove grainy particles or simply use it. Add boiled potato, grated carrot, green coriander, salt, and cumin seed powder. Knead and roll vrat ka paratha. So let see how to make this gluten-free vrat ka paratha or sama rice paratha. First of all boil potatoes and mashed properly. There should not be any lump in mashed potato. In a mixing bowl gather all the ingredients and combine them together. Do not add water. Mashed potato is enough to bind everything and make a dough. Now divide the dough into equal parts and start rolling them gently. Since it is gluten-free it is very difficult to roll, I used parchment paper and patted with hands. Dust with dry flour time to time. Do not worry if paratha breaks from sides. Seal it and pat again with the help of dry flour. Heat a tava or skillet and place the paratha on it. Cook in medium heat. Keep flipping till it gets brown color in both sides. Apply little oil on both sides and cook. Once both sides cooked properly take it on the paper towel. Repeat the same process with the rest of the dough ball. Serve this vrat ka paratha or sama rice paratha hot with curd or falahari sabji. Make paratha as soon as possible. Keeping it for longer makes this dough watery. It breaks a lot but just seals it and keep patting. hahaha true, actually millets taste amazing with vrat style preparation. may be ghee adds flavor. After seeing the vrat ka oaratha, I might not be feeling bad about fasting at all. Looks so flavorful with all the vegetables and the spices. Thank you, for liking the barnyard millet flatbread. By saying this is fasting special we are depriving ourselves..:)..we should be including these in our regular menu..the rotis look very inviting! yep I realized this while making all fasting recipes. we can make them in our daily routine. you are right PJ, that is the plan to use this millet. Perfectly made vrat ka paratha. Love your detail explanation and procedure. Thanks Renu, I am glad you noticed. Bhawana really like how the vrat ka paratha looks. I’ve never tried making one using just sama. Bookmarked and hopefully will make it for the coming Ekadashi. Wow… this paratha looks so fantastic, will def try this paratha in upcoming navratri.. Bookmarked. Thanks Preeti for liking vrat ka paratha. With all the spices, carrots and potatoes, these paratha look very colourful and don’t even need a side dish. Perfect to have with a cup of coffee. Thanks Gayatri for liking vrat ka paratha. That’s a lovely colourful and healthy paratha . It might be a fasting speciality but I am sure there’s absolutely no reason why we can’t enjoy it on other days . 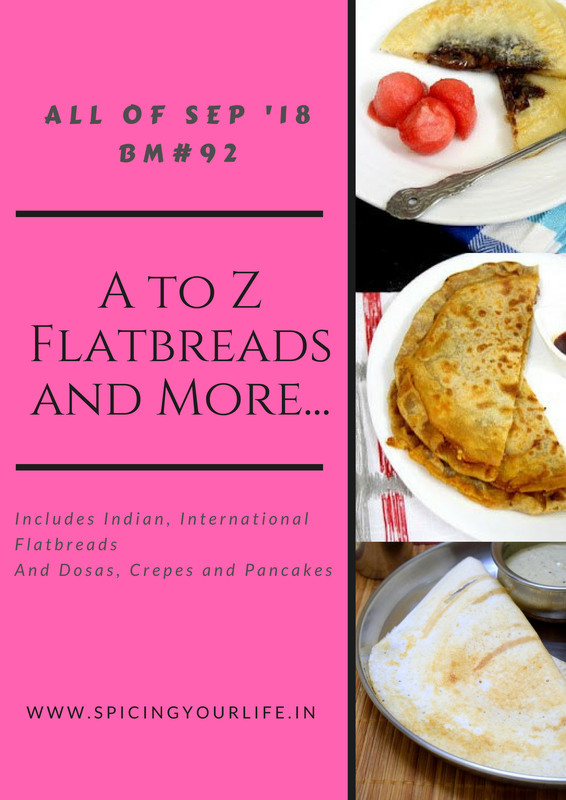 Excellent pick , the paratha surely is very filling too and can suffice as a complete meal . Thanks di for liking vrat ka paratha. Yeah I am surely gonna include them regularly in our meals. Sama rice flour is probably a hard to find for me but I was thinking I can cook the sama grain and work with that. what say you? but fasting or not this is a nutritious one. Try once dear, you will love this sama millet. This BM taught me to love these grains. Wow, sama rice paratha thats seriously very brilliant Bhawana, how pretty and healthy those parathas looks. Its quite a hard task to make prefect parathas like this with sama rice flour na. Well done yaar. Thanks, Priya, yeah actually precooked dough version is also there to make this sama rice paratha. will post that soon. Potato and carrot would have made the paratha so soft….perfect for an evening meal, irrespective of fasting!! Nice one! correct, even I realized these are so nutritious that should be consumed in normal days as well.